Pears are a member of the Rose family, along with apples, plums and quince, and begin coming into season late in the summer. Oblong in shape and relatively soft in texture, pears tend to have a mild but sweet, honeyed flavor when in season. Pears are a good source of fiber, vitamin C and potassium, all of which are important for maintaining a healthy diet. When to buy: Pears begin to come into season in late summer, and some of the most common varieties remain in season throughout the winter and into early spring. While grocery stores have pears in stock all year round, it is always better to buy produce when it is in season and, if possible, locally, as the flavors will be fresher and more often than not the prices will be cheaper. Green Anjou: In season October through June, Green Anjou pears are squat, almost round in shape and are green in color even when ripe. They have a firm texture and are sweet, and are best eaten raw. Red Anjou: In season October through May, they are very similar to the Green Anjou in taste and texture but have a deep red-maroon color when ripe. Yellow Bartlett: In season August through December. Yellow Bartlett pears are bell shaped, and have a skin that is yellow in color and sometimes tinged with red. These pears are very sweet and also great for eating raw. Red Bartlett: In season August through December. Very similar to the Yellow Bartlett in taste and texture, they are slightly smaller and bright red in color. 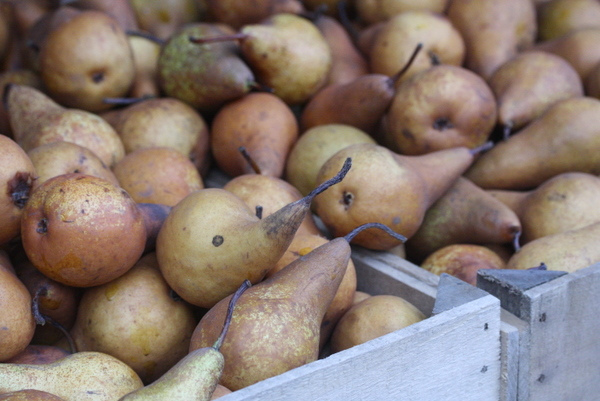 Bosc: In season August through April, Bosc pears are large and bell shaped with a firm, dense texture and brown skin. Bosc pears are mild in flavor and one of the most versatile varieties available, but are the best type of pear to be used when baking. Choosing pears: When buying, pears should be firm to the touch but not rock hard, as most will soften a bit after a few days. Try to choose fruit that are free of bruises and uniform in color. Pears are best eaten while still relatively firm, but are just as good when they reach the softer stage. Prep and Storage: Pears can be kept in a bowl in open air like apples, as they will continue to ripen after having been bought. However, some people may prefer to keep them in the fridge, as keeping the pears cold will slightly extend their shelf life. Try not to slice your pears until you are ready to eat them, as they will turn brown relatively quickly once they are cut. If your pear slices will be sitting for a little while – when you are preparing tart or pie crust, for example – you can sprinkle them with a little lemon juice to prevent them from oxidizing too quickly. Cooking with Pears: Pears are excellent eaten just as they are naturally – raw! Great for a quick and healthy snack, you can also add pears to a salad, pair (no pun intended) with a selection of cheese for a chic cheese plate, or layer into a sandwich for a sweet twist. Of course, pears are a great fruit to incorporate into desserts and cooked multiple ways ranging from poached to baked. If baking, Bosc pears are the best choice to use as they remain firm even when ripe and have the ability to hold their shape when cooked. Recipe Box: Check out some of these great recipes that incorporate pears! This recipe combines two fall flavors into a rustic tart…mmmmm. Here, creamy brie cheese and crispy tortilla are complemented by sweet and juicy pears. This drink spices up a classic with the sweet fall flavors of pear and cinnamon – yum! Here pears are used to make an ordinary grilled cheese sandwich into a gourmet meal. This recipe is perfect for an autumn dinner party, and sure to impress!